Liquids are an important part of our everyday lives. 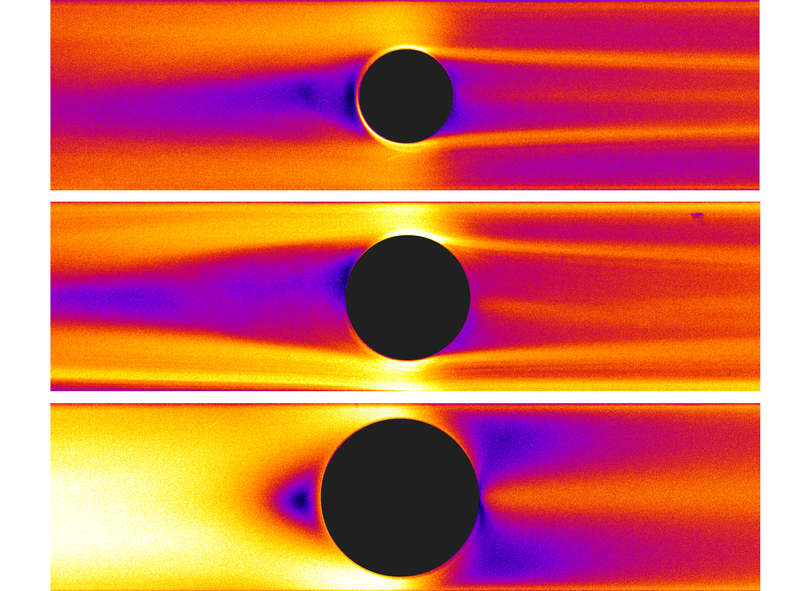 Fluids such as water are Newtonian, and their viscous behavior is well understood. However, many common fluids are viscoelastic. These fluids, such as those commonly found in cosmetics, soaps and paints, possess a combination of viscous, liquid-like and elastic, solid-like properties and we know surprisingly little about how they flow. Despite not knowing much about their flow properties, manufactures add these fluids to many different types of everyday products. Without viscoelastic fluids, life would feel much different. We wouldn’t be able to enjoy the rich lather of shampoos, nor the chewy texture of a gummy candy, nor the springy comfort of a well-built athletic shoe. To understand more about these fluids, researchers from the Micro/Bio/Nanofluidics Unit at the Okinawa Institute of Science and Technology Graduate University (OIST) study the flow properties and behavior of different viscoelastic fluids. Prof. Amy Shen, leader of the unit, and Dr. Simon Haward, the group leader of the unit, are investigating two specific types of liquids commonly used in manufactured products: polymer solutions and ‘living polymer’ solutions. Figure 1: Evolution of birefringence (top) and flow patterns (bottom) as the flow rate is increased from left to right. Flow enters the 4-way junction through top and bottom channels and exits through the left and right-hand channels. At low flow rate (left) flow is stable and symmetric. As the flow rate increases, the birefringence indicates stretching of the polymer and the flow patterns become increasingly distorted. The Micro/Bio/Nanofluidics Unit also studies the flow of ‘living polymers’. Like polymers, these materials form long chains of multiple repeating units, but unlike polymers, these units are not chemically bound together, but rely on other forces for cohesion. Wormlike micelles (WLM), a type of ‘living polymer’, form long, rod-like aggregates suspended in a solution. As with polymers, these materials have numerous industrial applications, including as additives in shampoos and cosmetics and as materials to enhance oil and gas recovery (EOR). Figure 2: A viscoelastic wormlike micellar solution flows around a cylinder in a straight microchannel, under conditions dominated by fluid elasticity. Scale bar: 200 µm (0.2 mm). This research, published in Soft Matter and featured on the inside front cover, revealed some unique flow patterns with the WLM solution. “Unlike Newtonian fluids,” Shen explains, “WLM solutions initiate flow instability upstream of the obstruction. Additionally, it was discovered that the degree of instability was directly related to the size of the blockage compared to the total width of the channel”.